THERE ONCE were two Pet Shop Boys who wrote a ballet based on a children’s fairytale. But, being electro-pop cultural dissenters who revel in throwing low-art at high-art to see what sticks, this would be no ordinary ballet. “There’s bits of X-Factor and Britain’s Got Talent in there, but it’s really a parable about fascism,” says Neil Tennant, breezily describing the content and form of The Most Incredible Thing . The ballet, which began a run at London’s Sadler’s Wells last week and continues until March 26th, is already causing quite a stir, not just in the ballet world but in the general arts world – “the cultural highlight of 2011” predicted one newspaper, and there are plans to bring it to Ireland and elsewhere internationally later this year. Featuring former Royal Ballet star Ivan Putrov, Neil Tennant and musical partner Chris Lowe spent a grand total of three years putting the music together for a Hans Christian Andersen fairytale about a contest a king stages in his kingdom for people to produce “the most incredible thing”. The prize is half the kingdom and a beautiful princess’s hand in marriage. 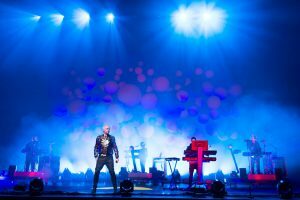 Choreographed by the “controversial” Javier de Frutos (one ballet work was pulled from the BBC schedules and he has received death threats) and featuring 16 dancers and a 26-piece orchestra, it is quite an elaborate staging and such is the challenge for the Pet Shop Boys to shift from dance music to contemporary dance music that Neil Tennant confesses to having sleepless nights at the moment as the project finally hits the stage and the dance critics arrive, wondering what a pop music act have done to their prized genre. It’s a surprising fact but the Pet Shop Boys are the planet’s most successful ever pop duo having sold over 100 million albums (and having had 22 top 10 hits). Though primarily known for their catchy pop-synth sound, they have always worked outside the parameters of pop music. Their “Performance” world tour in 1991 rewrote the rule book for how popular music can be staged. “It was essentially a contemporary dance piece, with 14 dancers on stage with us each night,” says Tennant. There was also a West End Musical, Closer To Heaven and six years ago they wrote an orchestral score for the silent film classic Battleship Potemkin which they first performed in Trafalgar Square to 20,000 people and then toured around the world. “Certainly doing Battleship Potemkin helped us in writing this, as the music here has to tell the story without words as well,” says Tennant. “And it really is a fascinating tale: what happens is that the winner of the competition is an extraordinary clock – a thing of real beauty – this clock represents and encapsulates the universe. There are the four seasons, the 10 commandments and the seven days of week and so on. “But just before the creator of the clock can claim his prize, a jealous rival smashes it – violently destroys it. And because smashing the most incredible thing is now the most incredible thing, the villain is going to win the prize but the clock rebuilds itself and kills the villain who smashed it up. So you have this parable which really fits in today, of how you can suppress something physically but you can never actually suppress the idea. They’ve put all the ballet music on to their new album, with the same name as the ballet, but Tennant doesn’t know if their name will attract Pet Shop Boys fans to a ballet or whether a ballet audience will appreciate the new album. While they were writing the music for the ballet, they were also writing and recording their last album, Yes , and Tennant feels that both writing modes fed into each other. “What we have found is that the songs – the pop songs – we have written since the ballet sound a lot simpler. Looking back there have always been, by pop music standards, quite sophisticated chord changes in our songs – I think that was the attraction of West End Girls . But the other day we wrote a three-chord song, which is a first for us. I think both the ballet and the pop music will educate each other. With the first preview night just two days off when we speak, Tennant is apprehensive but equally “endlessly fascinated” by the whole process of bringing a ballet to the stage.